Drogheda beat UCD in tonight’s top-of-the-table clash. SHELBOURNE HAVE MOVED level on points with Drogheda United and UCD at the top of the SSE Airtricity League First Division table this evening after a seven-goal demolition of Athlone Town. David O’Sullivan and Adam Evans scored three apiece for Shels as they recorded their fourth win of the campaign in emphatic fashion, with Dayle Rooney also getting on the score sheet in the second half. The result moves Owen Heary’s side up to 13 points alongside pacesetters Drogheda, who saw off UCD in tonight’s top-of-the-table clash at United Park. Gareth McCaffrey and Lee Duffy scored after the break to hand Drogheda a big three points, while the night’s other game saw Wexford draw 1-1 with Cobh Ramblers. Longford Town host Cabinteely on Saturday evening at 7.30pm. Email “Two hat-tricks and seven goals moves Shels level on top of First Division ”. 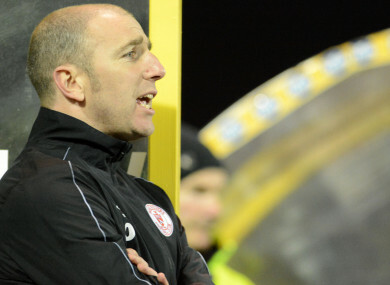 Feedback on “Two hat-tricks and seven goals moves Shels level on top of First Division ”.